So we left off in late February with some March goals and its only 10 days into April but these have been in the back of my mind ALL month so before we skip ahead to April goals, let's see how I measured up ;). A little accountability never hurt me! Well I tried my very best the weeks we were home I managed to get there 3 times but we did go to Colorado and were gone on Easter weekend so those weeks I didn't get there 3 times. However, remember I did walk a lot hauling kids to class in CO so I counted that as good exercise! I even tried aqua aerobics and it was a good class but low stress on my back, I am going again tomorrow. I did reward myself with a mango smoothie after class ;). I subscribe to the Proverbs 31 devotional emailed to your inbox really early every morning per the tip from my friend Emilie. The only downside is it is only downside is it is only delivered Monday-Friday. I sure miss them on the weekend. I literally open it up most days before my feet leave the bed. They are all really good and most days I quote them or share them with friends because they are THAT good and that practical. Some of my favorites from March were about being faithful when you are in the middle (Read here) and about making decisions as a Christian (Read here). If you don't have a devotional or you need a new one that is practical and just a perfect drink from God, I suggest you sign up :). I am not a good player. I like to do activities with my kids, go places with my kids, etc. but just to sit down and be with them at home is HARD for me. I don't love it so we did that sometimes but then we also ran errands one on one, we read books one on one, played games, did a craft, cooked together, or just cuddled together. It's surprising when you focus on it, you do notice you do do things with your kids and the guilt isn't so bad ;). It's still there because I am pregnant and tired and you know don't have enough of me to give some days but I am thankful to try and stretch myself as a mommy - they are worth it. AND its funny what they get excited about. Solon was pumped to go to Target with me all by himself to pick out his preschool snack and Vera was happy to do sand art with me that took all of 5 minutes ;). Sometimes just putting aside my agenda is good for me :). 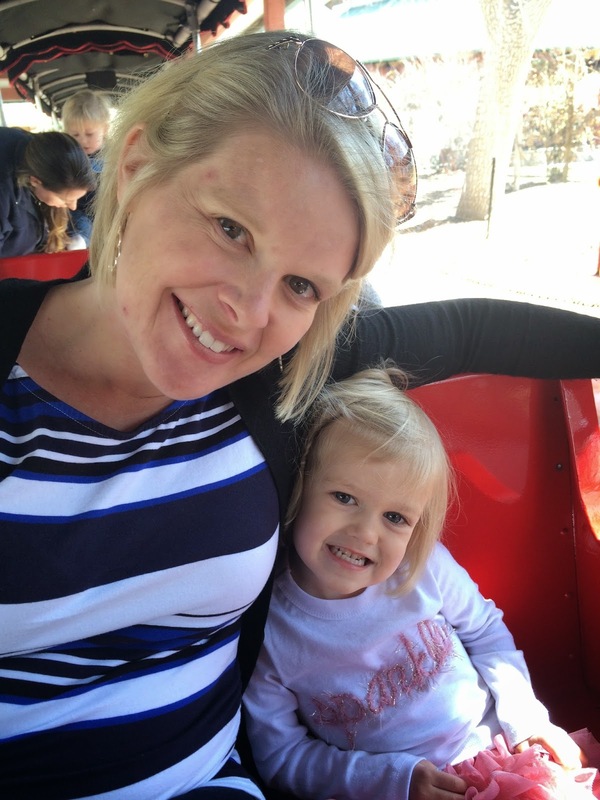 Besides skiing, playing outside and going out to eat as a family, we actually took an adventure to the Denver Zoo. It was a last minute call to go and we are so glad we did. The weather was beautiful and we left Breckenridge with enough time to do something in Denver. The zoo had lots of great animals we don't have at our zoo, we were able to eat outside and enjoy the sun, and the kids got to pick out a souvenir at the gift shop (a vacation treat ;). There is just something so fun being just our little family on a fun adventure together. I think we are entering the time where its fun to go on vacation with just us, even if its just a little weekend getaway. Scott and I are hatching up some plans and are going to GET IT ON THE CALENDAR so it gets done :). 5. Invite friends over for dinner or fun. We actually had 2 families over for dinner as well as our small group over for our annual March madness tournament party. It was a busy fun month of entertaining and April is shaping up to be a month of entertaining too. I know our days of hosting, might be put on hold with a newborn so we are glad to enjoy opening our home now! We snuck a lunch date in on April 2nd and we counted it. March was a busy month but we were thankful to get out to eat together and just talk and hang out. It was fun to do lunch too! We tried a new restaurant only open for lunch in town (sometimes better to test those out without kids). We have a few more places we want to go that aren't conducive to small but really cute newborns so we are hoping to get one more date in per month before baby arrives! I see all these fun, simple (lets be clear simple) crafts and activities online and I pin them, never to be seen in the abyss of my pin boards on Pinterest. I want to try one a week...I love doing things like this with the kids and the kids love it too. I just need some accountability. 5 crafts in April is doable ;). I didn't quite make it last month so I am going to continue on my journey. I know being fit is a benefit come labor and post-partum especially since I have to slip into a maid of honor dress 4 weeks after birth! 4. Read book with the kids every week day. Since I got sick and kids don't really nap anymore, rest time has been consisting of mommy snoozing while you watch TV. Sad but true! Scott reads to them most nights before bed but I have been missing those snuggle and reading moments we use to do everyday before nap. 5. Go on a family picnic. We love a good spring outing and tis the season to enjoy eating outside on a blanket! I have one final book in a series I have been reading by Karen Kingsbury and call me crazy, I have been avoiding reading it because it's the end and i don't want it to be over...but I need to read it! 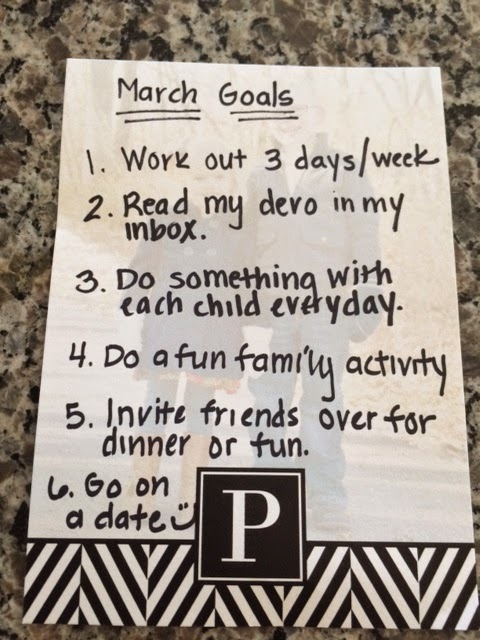 So there you have it some April Goals...I still plan on digging into my devotional, be intentional about spending quality time with my kids and hubby and nest but these are some things that have been on my heart so I am going to hold myself accountable! Happy April!